The chilly wind has begun to blow in London’s direction and I have started to think about coats. Except, this year, I have actually reached the stage where I have built up a decent coat collection, suitable for most occasions that for once, I don’t have to go through the trauma of looking for yet another ‘perfect’ coat. So, I would have been sitting back and chillaxing, but then lo and behold, in this week’s issue of Grazia, my heart leapt as this BEAUTIFUL silk chain print volumnious, coat with short sleeves and velvet cuffs cried out to me. 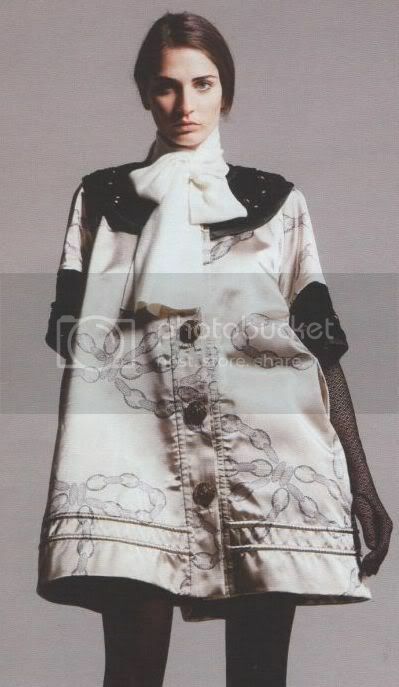 It’s by a label called Boudoir, designed by Central St. Martin’s graduate Disaya Prakobsantisukh from Thailand. Since, I’m no longer on a perfect coat search (nor the perfect boot search either), it should hopefully mean I can get a headstart on the "Buying the Boudoir Silk Coat for Susie" fund since it costs a sizeable sum of £600! Oh, but then I look at the Boudoir website and my heart sinks as the rest of the collection is equally attractive and ravishing. Which means the fund has suddenly become ‘Buying Boudoir’s Entire Collection for Susie’. It’s one of those labels where nothing is particularly original or innovative but it’s enticing because all the elements are just right and you want to wear every single thing. It’s a mix of tactile and light fabrics, volume, prints that’s uncompromisingly girly. Even worse, the site is launching an online store on the 9th of September. I can see myself tapping my debit card number on the site already. P.S. If anyone of you is a charitable millionaire, donations are more than welcome for my Boudoir cause! Am I the only one who finds that more than half of their Fall/Winter collection outfits look as if they belong to a Spring/Summer collection? Thank God layering is back in fashion this season! I have too many coats for my closet… it always seems that the most unpractical ones are the most beautiful… this brocade one is stunning. Don’t do this to me Susie.. I will turn away and pretend I never saw it. Those are all really beautiful…:::heartx10000::::….